The context of this piece is one of making a statement. The photograph on top was taking in London at the beginning of the year, when people from all over the world were protesting the war with Iraq. 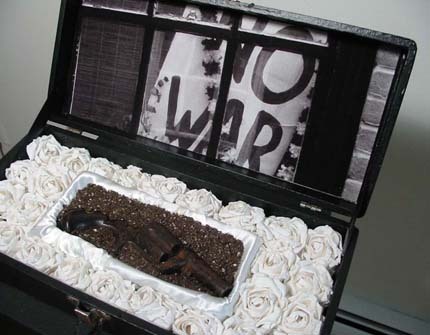 The gun on the inside of the box is partially buried in dirt, inside a simulated coffin and surrounded with white flowers commemorating Peace. Let's bury our guns and not our living.